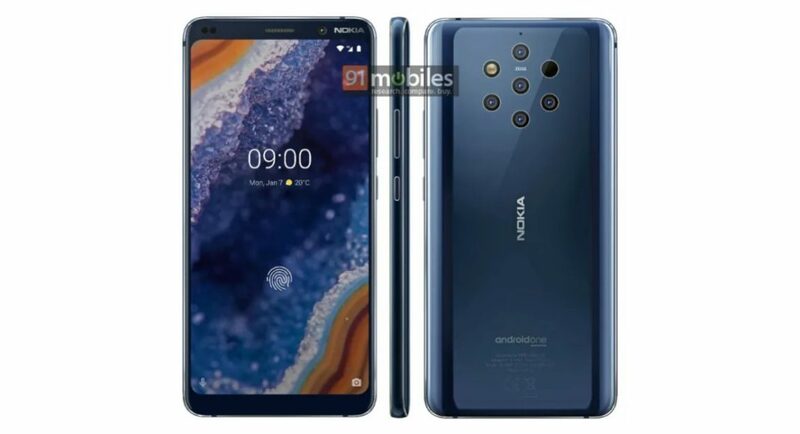 Nokia 9 PureView is one among the most-awaited smartphones from HD Global, and the company recently confirmed that the device will be launched on February 24 in Barcelona, a day before the Mobile World Congress 2019 begins. As the date of the launch of the Nokia 9 PureView draws closer, more and more reports about the device are surfacing online. And now, the official press renders of the Nokia 9 PureView smartphone have been leaked in a report by 91mobiles and it gives away the key design details of the upcoming flagship device. In the renders, it can be seen that the upcoming smartphone will come with a thick bezel on the top and will also have a broad chin. At a time when most smartphones are going bezel-less and notch-less, this can be termed as a little last season. The top right corner of the smartphone has the Nokia branding on it, and right next to it the selfie camera of the device is housed. Towards the centre of the top bezel is the earpiece of the upcoming Nokia smartphone and towards the left, the usual set of sensors are placed. Nokia 9 PureView can be seen with an in-display fingerprint scanner that can be used to unlock the device. Speaking of the back panel of the Nokia 9 PureView, the smartphone can be seen to house five cameras, an LED flash and an autofocus module in a hexagonal pattern. One of the sensors is placed right in the middle of this hexagonal pattern, and it also has a Zeiss branding on top of it. The back panel of the device also has the Nokia and Android One brandings on it. So this confirms that like all other Nokia smartphones by HMD Global, Nokia 9 Pureview will be a part of Google’s Android One programme, which means that it will get timely Android updates and security patches for the next two and three years respectively. Another thing worth noticing in the renders is that Nokia 9 PureView mobile comes with curved edges on its back panel, which will definitely help users in gripping the smartphone and assist in one-handed usage. The renders show power and volume buttons placed on the right edge of the smartphone. According to previous reports, Nokia 9 PureView will feature a 5.99-inch display with 2K resolution and will be powered by Qualcomm’s Snapdragon 855 SoC coupled with 6GB of RAM and 128GB of internal storage.